Amid a raging debate on the sedition law, President Pranab Mukherjee today said the Indian Penal Code (IPC) requires a thorough revision to meet the needs of the 21st century and changes are necessary in the "archaic" police system. "The IPC has undergone very few changes in the last 155 years. Very few crimes have been added to the initial list of crimes and declared punishable," he said at the valedictory event on the occasion of the year-long celebrations of the 155th anniversary of IPC in Kochi. "Even now, there are offences in the code which were enacted by the British to meet their colonial needs. Yet, there are many new offences which have to be properly defined and incorporated in the code," he said. The premier code for criminal law was a model piece of legislation but requires a "thorough revision to meet the changing needs of the 21st century", he said. In the light of the sedition law being applied on JNU students for allegedly raising anti-national slogans, there have been strong calls for either deletion or drastic changes in Section 124 A of IPC dealing with sedition. Underlining the threat posed by economic crimes, President Mukherjee said this impeded inclusive growth and national progress. "It is a challenge to bring all new age offences with its intricacies within the ambit of the criminal law," he said. According to President Mukherjee, the image of police depends on its actions and in ensuring prompt, equitable and fair enforcement of laws. "The 'Rule of Law' is the cardinal principle on which a modern state rests. It has to be upheld at all times. It is incumbent on the law enforcing agencies, particularly the police force, to fulfill its foremost duty of maintaining law and order sincerely and with dedication. "... The onus is on our law enforcing agencies to work towards transforming the archaic police system and bring it in tune with the requirements of a modern democratic nation," he said. He suggested some action points in this regard. "Our police officers must ensure quick redressal of the grievances of the common man. 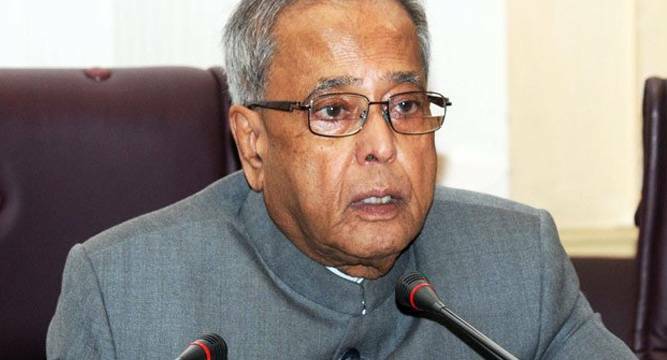 They must partner other stake holders in creating a peaceful and secure atmosphere conducive to progress and development," President Mukherjee said. He said police "must" go beyond its role of merely being a law enforcing body. "It had also be a proactive partner in growth and development. The founding fathers of our Constitution had conceived inclusiveness, tolerance, self-restraint, honesty, discipline, respect and protection of women, senior citizens and weaker sections as essential ingredients of our democracy.